Dan was 19 years old when he took his first job as a big game hunting guide. 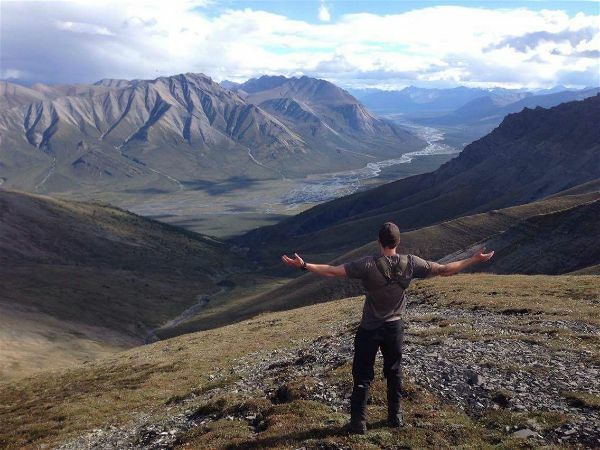 He joined his two older brothers Ben and Lorne on a 500-kilometre trek through the Yukon and Northwest Territories. 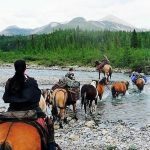 One of the world’s longest trail rides, it would be one of the loneliest and toughest trips he’d ever make, testing his physical and mental stamina in ways that hadn’t been tested in years. 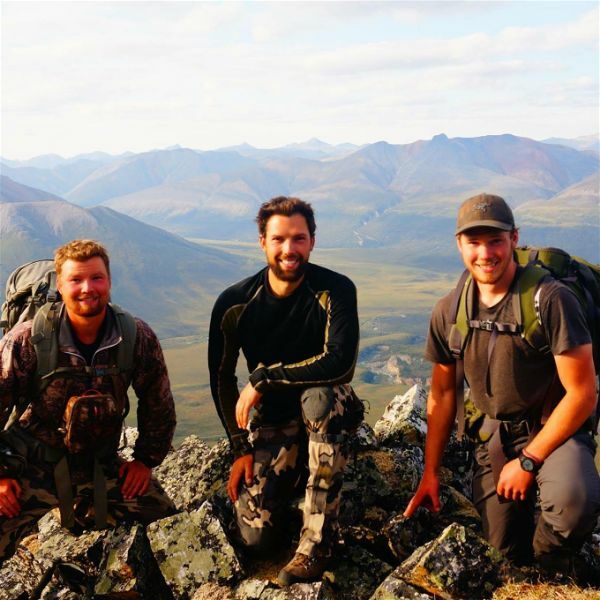 L-R Lorne, Ben and Dan Stourac on a guiding trip. It was their second season up north and, unlike the first season, the weather was unseasonably warm that fall. 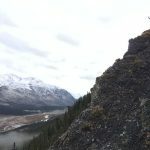 When Lorne was flown out to do a backpack hunt and Ben and the hunter left to take advantage of the late caribou migration, Dan stayed behind. He was alone with six horses and a promise that they would return in three days. 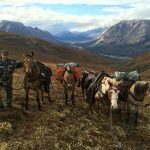 Horses are essential to the trip, carrying loads of gear and supplies from one campsite to the next. Dan stayed behind to tend to the remaining horses. On the second day, Dan was cooking sheep steaks on the fire when a bear started coming toward him. The bear was about 20 feet away on the other side of the river, jerking his snout in the air, sniffing out his next meal. Dan stood there dumbfounded with a couple of steaks in his hands. 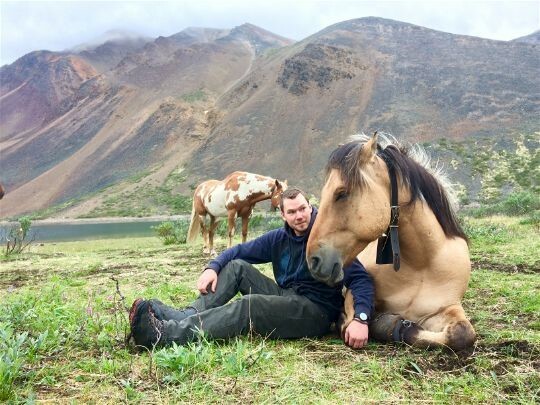 Dan and his horse Ditto at the end of their 500-kilometre trek. Sleep didn’t come easily for Dan that night. He eventually dosed off at about 2 am, but was roused from his sleep a couple of hours later. He fired a shot into the night and five sets of eyes disappeared. Losing any hope of sleeping that night, Dan built a large fire and waited for the sun to rise. 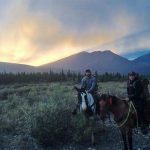 When the sun did come up, Dan set out to gather the horses. It was a bit unnerving for Dan as he tracked the horses’ hooves, which were overlaid with fresh wolf tracks. He brought back all six horses. They were a bit edgy and nervous, but untouched by the wolves. 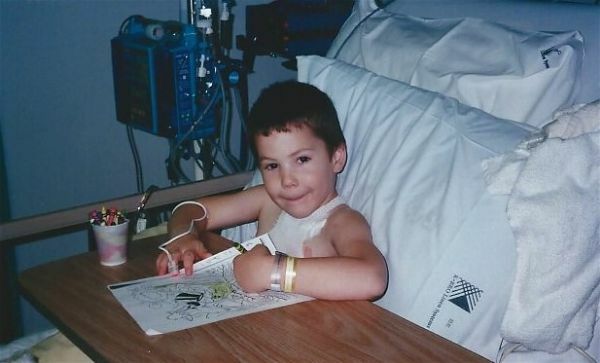 Dan as a youngster, receiving cancer treatments at the hospital. No strangers to adversity, Dan and his family had already battled their worst nightmare, when at age four, he was diagnosed with leukemia. At the age of seven, still on treatment, Dan and his brothers went to their first summer camp through Kids Cancer Care. 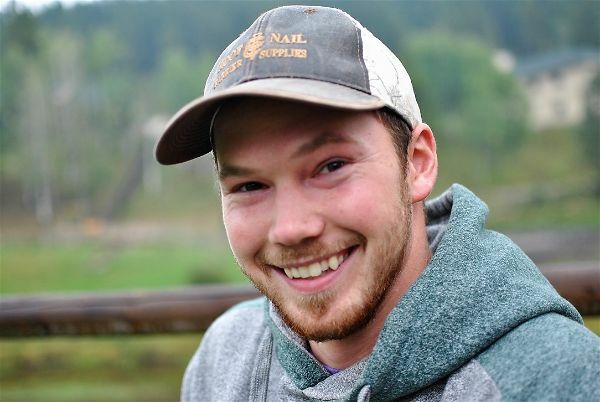 The boys grew up going to cancer camp and Dan credits camp with building the strength and resilience he needed to survive his experience in the Northwest Territories. Dan is fully embracing life with all of its pain and beauty. On the seventh day, Ben and the hunter returned, all smiles and swagger, showing Dan the sheep and caribou they harvested. Eventually, Dan’s cancer-related health issues would force him to quit guiding for a living. With a bad heart and Raynaud’s syndrome, his body struggled to tolerate the shock of subzero temperatures. Eliminating the possibility of ever guiding again, Dan returned home, taking on odd jobs, while finishing and self-publishing his first novel, Grim’s Prodigies, under the penname Remmy Stourac. Facing his own mortality on more than one occasion, in his first novel, Dan takes on death once again — this time on his own terms. 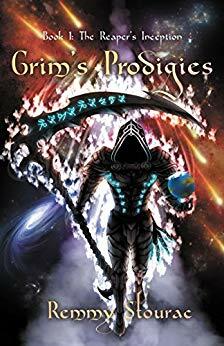 Grim’s Prodigies is the first book in a fantasy series called The Reaper’s Inception. Dan’s playful spirit and love of language are evident from the start. Its lively energy and easy humour stand in stark contrast to its serious subject matter. The Grim Reaper in Dan’s story is no static character. He struggles and grows over the course of the book. He transforms from a soulless demigod, ruthlessly taking the lives of his victims, into a being who cares about the people he takes. 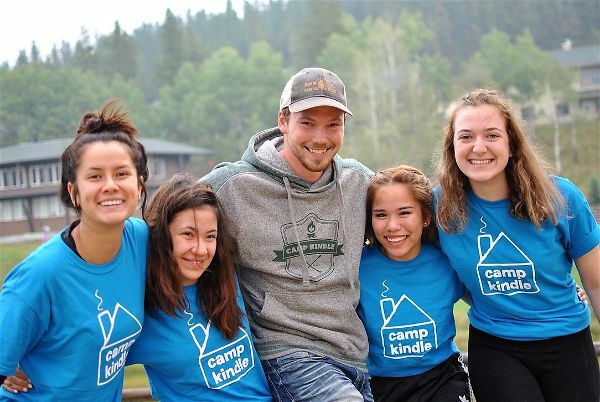 Later, as a counsellor and volunteer at Camp Kindle, Dan saw the transformative power of cancer camp in the lives of young campers. But this time he was able to see it as an adult. Pictured here with SunSeeker teens last summer, Dan is a role model and mentor to young people at Camp Kindle. Dan believes you need to give young people a chance to choose and then wait to see what they do. 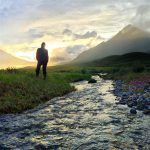 If you give them a choice and a chance to step outside their fear, they may not be so afraid to stand on their own when the peer pressure sets in later in life. 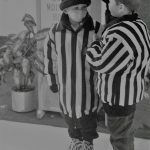 This is what camp did for Dan and why he is dedicating a percentage of the proceeds from his first book to Kids Cancer Care. If you’re looking for a Christmas gift for that person who has everything, why not order a copy of Grim’s Prodigies? Ten per cent of the proceeds will go to Kids Cancer Care and you’ll be opening a door to an epic new world of monsters and mortals and a refreshing and authentic new voice in sci-fi fantasy. To order your copy or for a full book review, visit http://remmystourac.com/. Little Dan while on treatment. Dan with horses up north. Brilliant! This story made me laugh and cry. How inspiring! Dan has grown into a wonderful young man. I like that he has given back to Camp Kindle as a camp counselor and volunteer. Good luck with your series of fantasy novels, Dan or should I say Remmy? Kids Cancer Care, I am already on your email mailing list. Thanks for your comments Lorraine. Dan is such an inspiring young man, so courageous and humble at the same time. Glad you enjoyed the story.